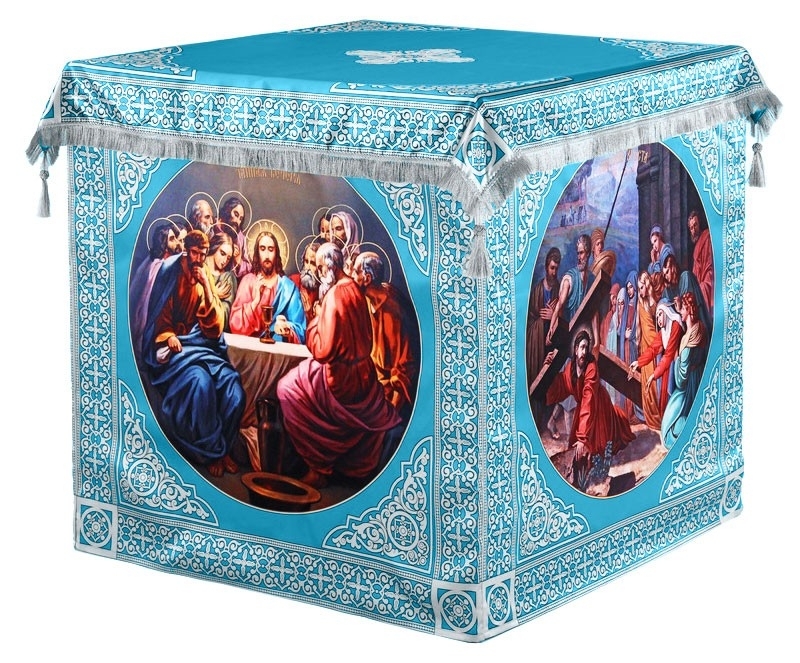 Orthodox Church liturgical Holy table vestments (blue-silver) by Istok Church Supplies Corp.
Istok Church Supplies invites customers to discover our impressive collection of blue-silver Holy Table vestments. You can trust us, like hundreds of customers do from around the world, to deliver high quality workmanship, traditional style and reasonable pricing. We specialize in providing bespoke church vestments in accepted liturgical color combinations. 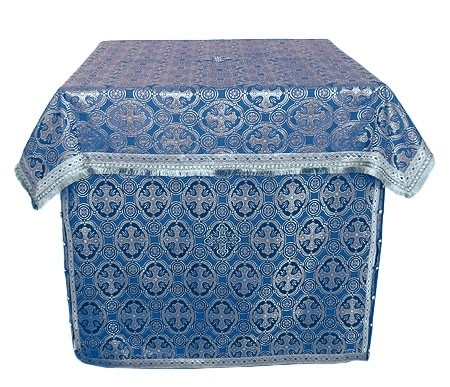 Our blue and silver Holy Table vestments are elegant in appearance and complete in themselves. 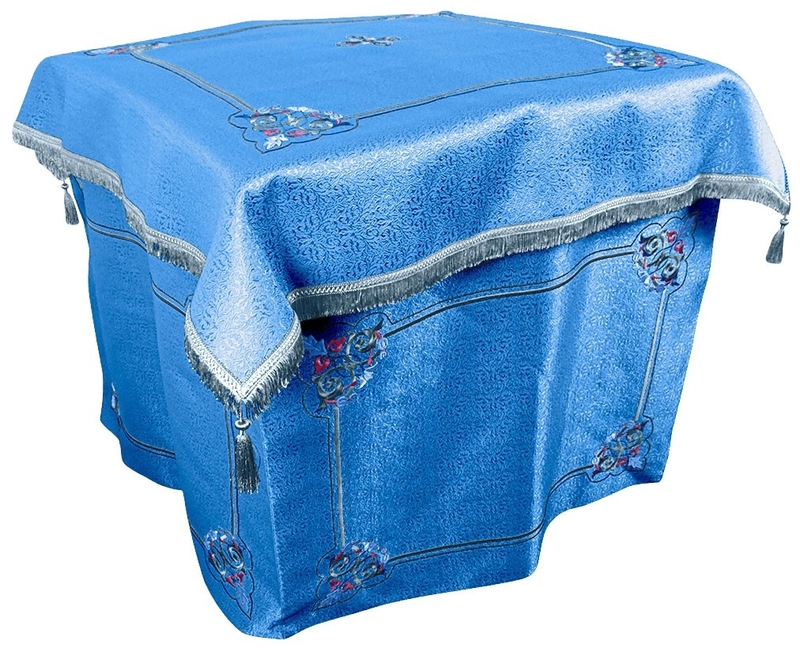 Blue is the color associated with the Most Holy Theotokos and our blue-silver Holy Table vestments are guaranteed to enrich the spiritual ambience and appearance of the Holy Altar. These vestments are offered in three lavish fabric choices – silk, brocade and embroidered natural German velvet. The fabrics we use for our silk (rayon) and brocade Holy Table vestments are richly patterned. 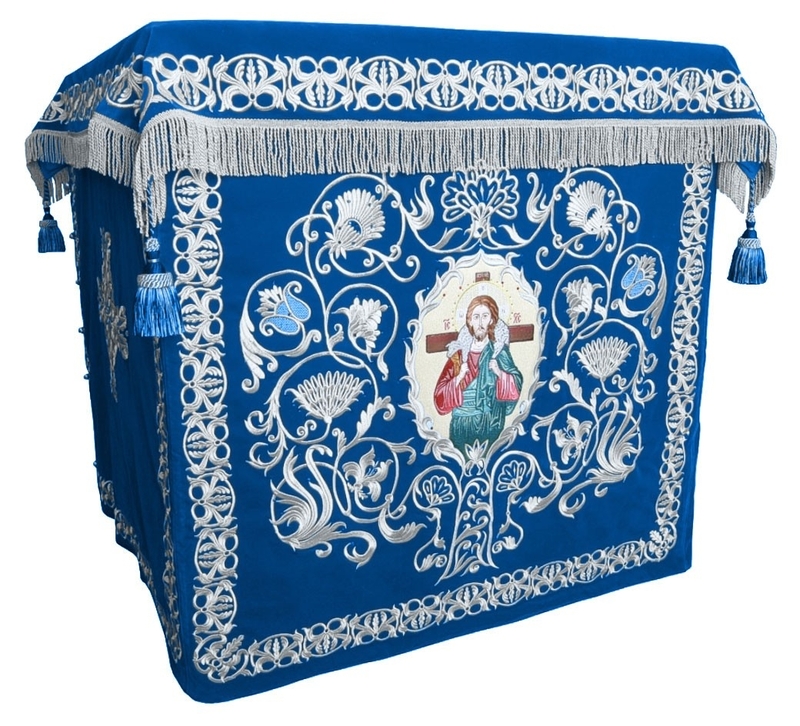 Embroidered Holy Table vestments are available in different shades of blue and feature different designs ranging from simple to intricate Christian themes. From the fabric type to the adornments and size, we offer many customization options. We provide standard decoration in the form of galloon but customers who desire more elaborate decoration can select premium type. Customers can also add velvet inserts to their order for an additional fee. To ensure the perfect fit, we request customers to provide the correct measurements of their Holy Table. Since each order is individually executed, we require a few short weeks to complete your order after which it will be shipped using reliable courier services. Prices of these vestments range from a few hundred dollars to a few thousand dollars. Customers will find that our prices are extremely reasonable when compared to market prices. There are various ways, like signing up for our loyalty program or purchasing more than one unit of the same item, to obtain more cost savings. We thank you for your interest. Feel free to scroll down and explore our fantastic collection of blue-silver Holy Table vestments.